A couple of Fridays ago, I did a post on Patti Abbot’s Forgotten Books for a Hashknife Hartley and Sleepy Stevens novel. Today, I’m posting on a couple of radio episodes of our range detective cowboys. They originally ran on Sagebrush Theater for the Armed Forces Radio Network in 1950 and had the cachet of a bit of narration by W. C. Tuttle himself. They way they are presented everywhere I look, these were the only two Hashknife and Sleepy stories to make radio. Frank Martin played Hashknife and Barton Yarborough played Sleepy. I couldn’t find out anything else about the rest of the cast(I probably wasn’t looking in the right place), but I believe I recognized one voice in the DOUBLE CROSS episode. Unless I’m completely goofy(not outside the realm of possibility), James Best played the young man accused of murder. Best is probably best known for his role as Sheriff Roscoe P. Coltrane on The Dukes of Hazzard, but I remember him more for his two spots on The Andy Griffith Show as Jim Lindsey, guitar player extraordinaire. 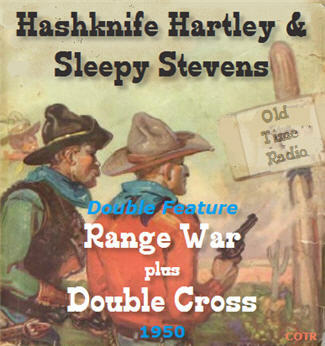 In DOUBLE CROSS, Hashknife and Sleepy ride into town just in time for the murder of a rich rancher. They learn he had just broke up the wedding of his daughter and a “$20 dollar a month and found” cowboy. The cowboy had threatened the rancher’s life as he stormed out. It’s up to our two heroes, well actually just Hashknife as Sleepy seems there for comedy relief as much as anything, to figure out what’s going on and prove the young man innocent of the murder. RANGE WAR has that old plot of two ranches wanting control of a range. Hashknife and Sleepy ride up to find a young fellow working on a cabin on a nice piece of range land. They stop to talk, learning he’s just recently filed on the land, has a small herd of a hundred cattle, and is planning to send for his wife as soon as the cabin is finished. About that time, the rich rancher rides up and demands he get off his land. He admits he’d always planned to file on it, having used it for grazing land for ten years, but had never got around to it. That sets the stage for the coming tussle. Someone decides to play the two men against each other, stealing half the smaller man’s herd one night and the same amount, fifty head, of the big man’s the next. We learn early on who the culprits are and it’s up to Hashknife and Sleepy to again figure it out before blood is spilled and things really get out of hand. These two episodes are available HERE for a reasonable price(which is what I did). It works in MP3 players and your computer, but won’t play in standard CD players. You can also listen to the two episodes HERE. (which I also did). They were a lot of fun listening to these. I paid for them, but OTR has sent me discs in the past. I have one(of five) from the Gunsmoke radio program and the two disc set of Philip Marlowe(a particular favorite). I’ve been having a fine time lately listening to the old radio tales of Gunsmoke. The show ran from 1952-1961 and starred William Conrad of Cannon fame as the Marshall of Dodge City. It overlapped the TV version which started in 1955 and ran through 1975. Some of the episodes have featured real characters from the history of the old west such as Doc Holiday and Billy The Kid. I’m sure there will be others as a I progress through the list of shows. The history I’ve researched says it started with the idea of a hardboiled Philip Marlowe type western and two audition tapes were made, the first what they were after and the second a more traditional western. The actor in the second wasn’t available for a western, so the project was shelved. An interesting note in the two audition shows was that the character’s name was Mark Dillon. Jump three years when two men were looking to create an adult western, as opposed to The Lone Ranger and The Cisco Kid, more for younger listeners. Mark became Matt, William Conrad took the role, and history was made. The role of Doc was played by Howard McNear and Chester was Parley Baer, both veterans of the Andy Griffith Show as Floyd the barber and Mayor Stoner respectively, and Georgia Ellis as Kitty. The photo is a publicity still made for the program. The characters here are a bit different from their television versions. Matt was a bit more ruthless, though not a killer mind you, Doc was nastier, almost a drunkard at times, and Kitty was more the traditional saloon owner. They never mentioned on TV that most saloons kept a string of “girls.” I’ve never seen the early television episodes, so they may have been the same back then. I don’t know. Television sometimes tames them as the years role by and the show becomes more favored. The set I’ve started on comes from the good folks at Old Time Radio Catalog. I’ve been having a great time exploring the site to see what they have available. The entire Gunsmoke series(400+ episodes) is available on five discs in the Mp3 format, which allows up to fifty hours per disc(the first I’m working on has 94 half hour programs, including the two audition shows). They won’t play in regular audio players, but I listen to them on my computer as well as an Mp3 player. I like the format as it keeps the number of discs small, making one able to have extensive collections, even without a lot of room for storage. Very convenient. Old Time Radio Catalog has a large number of shows available of all types: westerns, mysteries, sci-fi, variety, comedy, drama. Here\'s a link to their site. Anyone interested in the old radio program can certainly find what they like there, whatever they favor. The prices are very reasonable as well. Myself, I plan to pick up more and will report on them as I do. Now back to the first disc. It will take a while to get through over four hundred episodes. Final note: one thing I find of interest in these shows. They carry the original broadcasts completely, with commercials and announcements as well. Normally I’m not a commercial liking person. But these give one a little insight into life during these times. The first broadcast was April 26, 1952. Some announcements talk about the network’s coverage of the upcoming Republican and Democratic conventions. Those would have been the ones that selected Dwight D. Eisenhower and Adlai Stevenson to run against each other.